A confirmation is a religious event you usually celebrate with a party following the ceremony. When planning your confirmation party, choosing a type of centerpiece is an important decision. There are many types that you can buy or make yourself. White decor is an appropriate choice for a confirmation party. Flowers make the perfect centerpiece for a confirmation party. You can buy already arranged flowers or make arrangements yourself. White roses with baby's breath work well in confirmation centerpieces. Using potted plants as centerpieces is another option. Potted orchids or gerbera daisies look lovely as centerpieces. Candles can make a gorgeous centerpiece for your confirmation party. You can put a hurricane glass on top of a round mirror with the candle placed on the mirror. The reflection of the flames in the mirror will look spectacular. A confirmation is a religious event, so white candles are fitting. Alternatively, you can simply put several candles of different heights and sizes in the middle of the table. 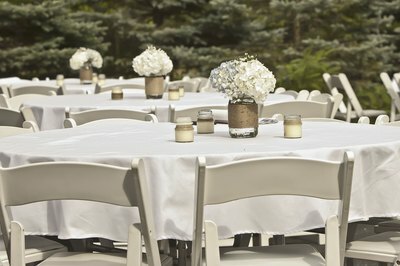 Again, choose white or off-white candles for the centerpiece. Tie a pretty ribbon around the candles. Another idea is putting water in a glass bowl for the centerpiece and having several votive candles floating in the water. This effect is often perfect for a confirmation party. A confirmation party is the celebration of a religious event. Crosses as a centerpiece are fitting. There are several ways you can accomplish a perfect centerpiece. Use one big cross or several smaller crosses. You can incorporate rosary beads surrounding the cross or draped over it. Try putting a flower wreath around the cross. If you use a flower wreath, use white flowers in the wreath.